Making sourdough bread is a fascinating, rewarding, exasperating and infuriating process, frequently all at once. 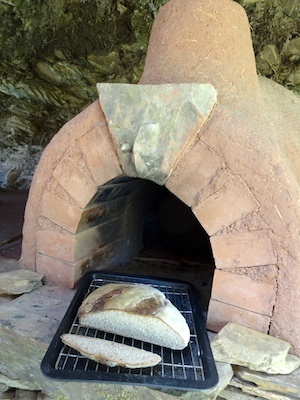 It’s never the same from one bake to the next, especially when you live most of your life outside and use a wood-fired oven. It takes a lot longer than making bread with fresh or dried yeast, and the way the starter behaves is very dependent on prevailing ambient temperatures, not to mention changes in the natural yeast population, so with the more unpredictable weather this summer, more than once I was caught out by a cooler-than-expected day which threw all my timings. As I learned more and more with every batch, each time I’d start the process thinking “this time I’ll nail it!” and each time I’d be proved wrong. For a good while I thought this was down to my inexperience with it, but then I learned from the son of an Australian baker and sourdough specialist that it’s always like this and after 30 years he feels he’s only now properly getting to master it. Yet there is a reward in the process, let alone the taste of the final product, that goes beyond the occasional frustration. It is very definitely worth it. Making a sourdough starter is just a matter of making yourself a natural yeast trap and then cultivating it some. Natural yeasts float about in the air so you don’t have to go catching them. They will catch themselves. Take 50g of the flour (or mix of flours) you’re going to use in the bread and mix it with 50ml of water in a clean jar with plenty of room for expansion. Some people recommend sterilising, but I didn’t find this necessary. 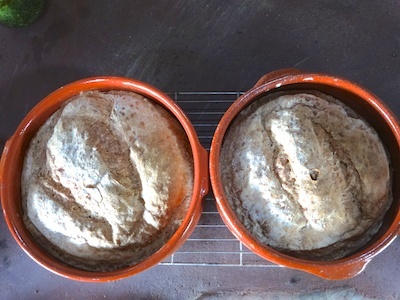 I use 1/3 spelt and 2/3 strong white flour and use our spring water rather than water from the stream. Loosely cover and leave 24 hours. Discard all but a teaspoonful, wash the jar out and mix the saved teaspoonful of starter into a fresh 50g flour/50ml water. Return to the jar. Repeat this process a day or so more (or as many as it takes) until the starter is frothing up nicely, then double the quantities to 100g flour/100ml water. At this stage, the starter can be kept in the fridge between bakings to save on flour. If at any stage the starter gets forgotten about and goes a little vinegary, all is not lost. Provided it’s not past the point of no return, pour the watery liquid off the top and take your spoonful from the bottom of the jar. It actually develops the ‘sour’ quality in sourdough a little more if it goes like this and is no bad thing as it improves the flavour of the loaf. The day before you want to bake, take the starter out of the fridge and refresh it (100g flour/100ml water). When it’s at or soon after its frothy peak, add a spoonful to a fresh 100g flour/100ml water, let it get going a bit, then return to the fridge. Mix the remaining starter into 300g flour/300ml water and put in a bowl to rise. It’s good to time this bit to take place overnight – if you’ve got a warm place to leave the starter at that time – because the rest of the process is going to take around another 6 hours, possibly more, and that’s before you even get to put it in the oven. When the starter is good and frothy, add it to an additional 500g flour/250ml water. Add 10g (2 teaspoonfuls) soft brown sugar and 10g salt, turn out onto a floured board and knead for a good 10 minutes until the dough is elastic enough to be stretched so thin it’s almost transparent. Dust with flour, return to the bowl, cover with a tea towel and put in a warm place to rise for about 3 hours. Knock back, divide in two, and either put in oiled loaf tins or line a bowl with a floured cloth and place the dough in the centre to rise. Score the tops of the loaves. Allow to rise another 2½ hours. 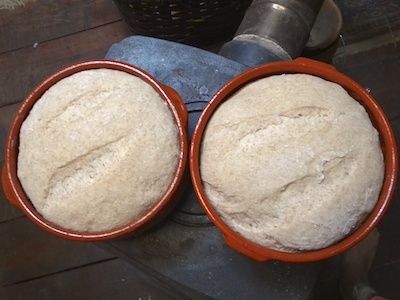 Sourdough needs something to contain it as the dough isn’t as firm as ordinary yeasted bread so will tend to spread. 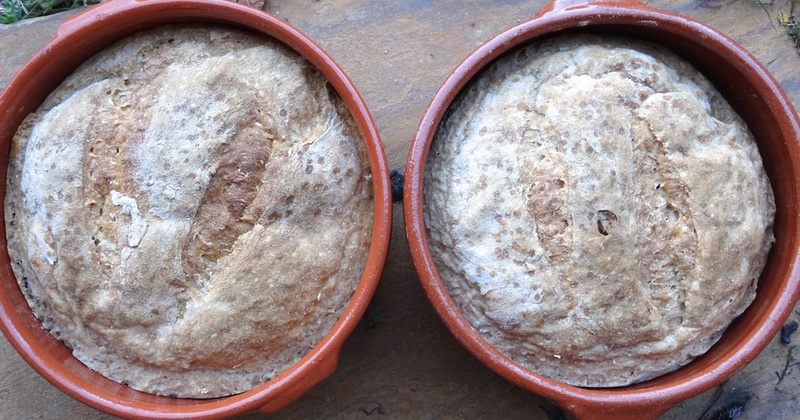 I’ve been using oiled terracotta bowls as loaf tins. Turn out of the bowls if using the cloth method, then bake in a hot oven 35-40 minutes until the loaves sound hollow and have a good crust. 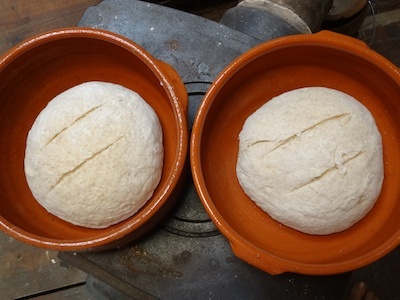 Sourdough’s sensitivity to temperature changes extends to the risen dough – because I’m baking outside, the dough often sinks quite a bit between removing the tea towel and getting it into the oven, even if I’m only moving it a metre or so. Will have to think of a way of minimising this. Regardless, the bread is delicious. Oh Lord no! That’s horrendous! I think I need to do some editing. Thanks for the heads-up Mike. Hopefully (after editing) that should disappear again shortly. Sorry for the confusion Sophie. You start with your 100g/100ml base starter from which you’ve removed a teaspoonful only (about 5ml) and add this to 300g flour/300ml water. So you have as good as 400g/400ml in total, OK?. After it’s all got good and frothy, you then add it to 500g flour/250ml water to give you your final sourdough mix for 2 loaves. So the total is 900g flour to 650ml water. Does that make sense now?